The Etsy shop comment caught me off guard. That might be the funniest comment you have ever made!!! Love the prayer journal. Things like that keep me accountable. Always good to have a tab for our hubbies....and their comments! A journal is a great way to remember things, and it will hold you accountable to your commitment to prayer. I love the zebra print! Wanted to say HI to Luke since we know he's reading now too! Yup the very best line.."Clearly, I will be setting up an etsy shop soon!" Love it! and ps I'm so awful with grammar. Please do have Luke or your gma read my blog because they will probably freak. and pss. Just stand next to me and you will be a giant no longer! You are a little bitty thing silly! I'm still laughing that he called you a giant. Only b/c it's totally not true... and b/c it sound just like something Joey would say. Since he does call me Big Mama. And sometimes I've been known to tear up. Ummmm, something tells me that book will be filled with extra prayers for Luke, haha!!! Love this!!! I just love it when our husbands say things without thinking!! ;o) ...or maybe they are thinking and the just claim not to be?!? 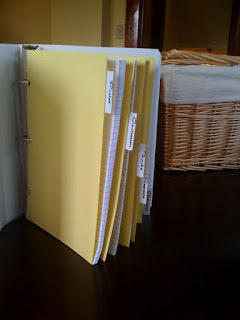 I never thought of making a binder! Thanks for the inspiration. I've been feeling really rambly with God lately, too. What are your tabs? out of curiousity... Like school, money, family, self... or are they like thanksgiving, requests, world issues... ?? I'm laughing out loud. From one giant to another...I feel your pain. Love your journal, so cute!! Go girl, and my mom always likes to tell me when she sees grammar errors in my post!! I'm sure I made a few in this comment! I am going to have to go close my office door, because I am laughing so much! I love your humor! Oh Luke! I cropped the pic of you and me because I thought I looked thick in the waist standing next to you and your tall, skinny self! Ty and I are always joking about weight. He calls me chumbawamba. You know from that tubthumper song, I get knocked down. I don't even know what a chumbawamba is but it sounds like a BIG person. Your etsy comment had me cracking up too! I'm sure God does appreciate the zebra paper! This was a great post! I needed some laughter in my day! I love your prayer journal! I definitely need one of those! What a great idea! And you are so not a giant! good idea... 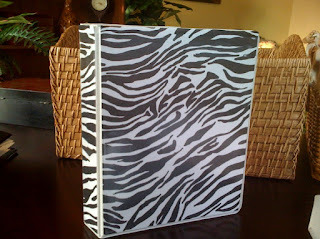 I LOVE zebra print anything pretty much! Unless they are like you said, leggings or skinny jeans. but what are the tabs for? You write prayers for different people in the different sections? Just wondering. I second Taryn's question. Are the different sections for different people/subjects? Also, do write the prayer request and then later on, the follow-up? I'm just curious as to your method. I lose track sometimes, so I like to hear what other people do. Oh.... and, I truly wish I was as "gigantic" as you. You are super tiny, lol. this is great!! Sometimes boys do NOT think. Brent is also always trying to pick at my grammar! I like your journal! I've been wanting to make a new one! funny that you mention zebra leggings...at least THREE little elementary kiddo's had them on at school today....UGH! THEY WERE HIDEOUS! Girl, you crack me up!! And, I didn't even notice that in the picture yesterday. That's hilarious that because you're taller he said that. Typical guy comment. LOL! Oh for goodness sakes!! You DON'T look like a giant! !